What is “strength?” An over statement of the obvious? A fore gone conclusion? Hardly! When one considers the historical evolution (or lack thereof) of strength training in sports and fitness, what should be blatantly obvious is instead blatantly obscure. In my last column, I suggested that to define strength we must focus on the source of strength … the muscle tissue. When stimulated, the function of muscle tissue is to contract. Contraction of muscular tissue results in the production of FORCE. As such, it would make sense to define strength in terms of contractile force production. Simple and unequivocal, regardless of movement and how that force is expressed around our third class leverage skeletal system. Given THE WHAT, the next logical question would involve THE HOW. In other words, if strength is the product of contractile force, what is the most effective means/methodologies for increasing contractile force outcomes?Once again, a simple question, yet within the context of mainstream interpretation and application, is very complex to say the least. Given such diversity and disagreement, it becomes apparent why ignorance, confusion, frustration and paranoia is the rule rather than the exception when one begins to formulate a philosophywith regard to strength development. Rather than sharing a consensus understanding of strength and universal means of developing it, different planes of understanding create a dichotomy in training methodologies. In an attempt to clarify the prevailing misunderstandings regarding “strength”, in future columns we will discuss what strength is notand the fallacious protocols that have resulted in an industry fast becoming one where the blind are leading the ignorant. 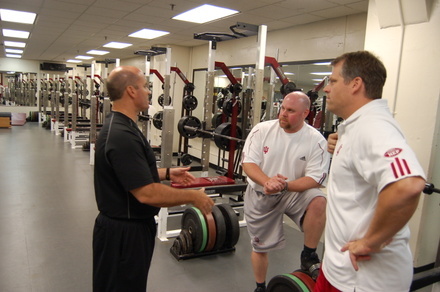 TAKU’s NOTE: This week brings the third part in a three part series from NFL Strength Coach Mark Asanovich. Check out part 1 & 2 for the complete story.